* Please know your WOMEN size before ordering. * This Custom Rhinestone Bling pair of shoes are Great Gift for ALL ages. ✨ Request another color stones via email 1st before you buy ✨100% Authentic Brands ✨ Competitively Priced ✨ Custom Design process can take about 2-2.5 weeks ✨You can visit any mall before buying these from us to see what youth or men size you wear. * Please know your men or youth size that equals womens' as we may use men or youth sizes. (That's why these are listed under Unisex). All sales are final. * You can request another color stones via email 1st before you buy. 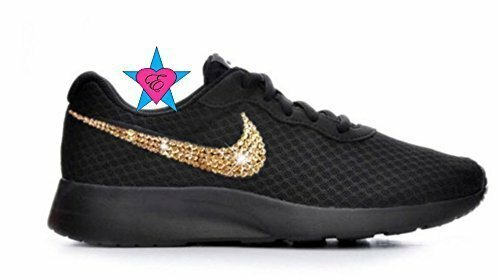 ** This handmade there are NO refunds or exchanges, if you need a repair done on the swoosh we offer 1 time free repair (you pay to ship to us) and we will add more stones to logo BUT only after 10 days from delivery date (no exceptions). In box us if this is needed. If you have any questions about this product by Eshays, contact us by completing and submitting the form below. If you are looking for a specif part number, please include it with your message.